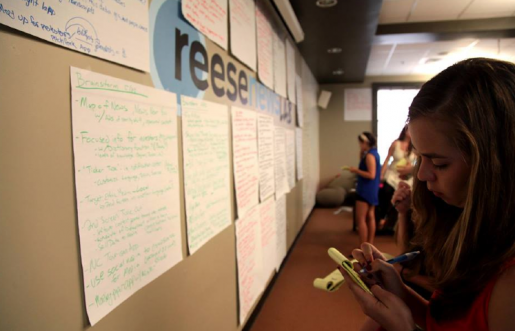 Before creating an actual product, the Reese News Lab first wants to understand and prove the problems their products aim to solve. Image from Reese News Lab. What is value anyway? We throw the word around so often that we forget what it really is about. Or worse, we assume what the media does is automatically valuable because we believe in it so fervently. Journalism is valuable and necessary to our communities and society but not everyone finds it personally valuable. "In creating value for a customer, we must ask a different question than 'what are we doing for our customer?'" Value is about more than worth; it’s about usefulness. I like Clayton Christensen’s “jobs to be done” concept. Christensen says that we hire products and services to do jobs for us–it’s not that we want the product so much as we want what the product provides. Image from Reese News Lab. In creating value for a customer, we must ask a different question than “what are we doing for our customer?” That question has the tendency to lead us down a path where we describe the product or service we’re giving customers. In the Lab, we call this feasibility. All the technical elements of how a product work are about feasibility. But creating an actual product doesn’t do anything unless we first understand and prove the problem our product aims to solve. Consider my personal experience in deciding to give my son a cell phone. If you ask him (and yes, I did), he will say he wants to be able to text his friends, watch Stanley Cup Playoff highlights and play games in the car because riding down the road is boring. Ask me, and I’ll tell you I want the ability to communicate with him when I drop him off for hockey practice or when he’s staying with a friend. In short, I want some reassurance that wherever he is, he’s OK. Neither of us would simply say we wanted to buy a cell phone. But even if we did, simply asking us “why do you want the cell phone?” would uncover insights about the job being done for us. Asking “why?” uncovers value. And true, personal value – usefulness – leads to sustainability. Products, such as a cell phone, deliver completely different value depending on the user or customer. Image from Wikimedia. It’s also important to note the same product – in this case a cell phone – delivers completely different value depending on the user or customer. In this case, my son is the user and I’m the paying customer. We experience the challenge of creating value early on with our newly formed teams. One team had the idea of creating a type of debate system for online discussion. The assumed value was people want to be informed and would do what it took to prepare for such a discussion. We began the interrogation. Why do people want to be informed? Why would they prepare for a discussion? Why would people want to debate in this system? Why do people debate? Why would people not debating care watch such a discussion? The answer? People probably want to win the debate. They want information to help them beat their friends in a debate. They want to appear smarter than someone else. Bystanders want to be entertained while killing time. Does that mean informing people about current events, topics and opinions isn’t valuable? Absolutely not, but doing that might not be what is valuable to each customer personally. It might simply be a by-product of the debate game, and that’s perfectly fine. The point is that we’re focusing on the value for the customer. To get teams thinking about their value proposition, we play Mab Libs. Initially, we focus on the first three lines because we don’t want to get into specifics about our product or service. It forces teams to think about the value to the customer. We encourage the teams to complete the Mad Libs with any product or service they use. It may be a silly example, but the value to the customer (me) is quite real. A cell phone isn’t the value; it simply provides the value. In the future, someone else may come along to replace the cell phone as the provider, but the value desired would still exist.